6 Best Lift Kit for F-250 Super Duty Reviews in April 2019! The concept of leveling and lifting vehicles is not just for pimping your ride, it is also a great off-road performance enhancer and when combined with larger tires will give your truck greater rough and muddy/sandy surface traction and performance. This is Ken Coul, your online auto-mechanic with over 10 years’ experience in pumping and pimping up vehicles for street and off the road optimized performance. I present you with six of the best lift kits for your Ford F-250 trucks. This Ford F-250/35 and 450 Super Duty lifting kit fit all single rear wheel and dual rear wheel models. This kit will give you a load leveling capacity of up to 5,000lbs. This kit will reduce all that harsh, rough road jarring and gives you 5 to 100 PSI air adjustability. This kit is designed to fit all models that do not have a fifth wheel hitch, but it will not work with cab & chassis applications. The Air Lift #88396 come with mounting brakes and the hardware for installation. The internal jounce bumper is designed for driving on an empty airbag while preventing damage. There are 2 air springs, and airline and a Schrader valve. The Rough Country #50220 3” Suspension Leveling Kit gives you an easy bolt-on installation and provides you with one of the most comfortable rides with its Premium N2.0 series shock absorbers combined with the kits radius arm drop brackets that properly set your caster and level the front and rear suspensions. This kit works with 2017-2018 4WD Ford F-250 Super Duty but is not to be used for F-350 models, dually models, and 4″ rear axle tubes. The front kit comes with coil spring spacers, radius arm drop brackets, track bar drop bracket. The rear comes with 4in lift blocks and U-bolts. There are 4 Premium N2.0 series shock absorbers, and the kit comes with all the hardware. 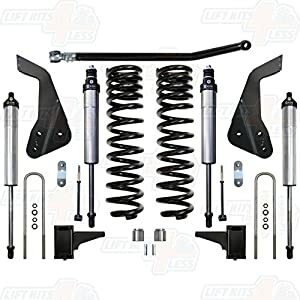 The Rough Country # 478.20 4.5” Suspension Lift Kit is good for all 2008 – 2010 4WD Ford F-250/350 Super Duty trucks. This kit comes with the Rough Country N2.0 shock absorbers, so you get that premium smooth ride. This kit comes with coil springs matching OE coils and a relocation bracket heavy-duty track bar that matches the steering angles and centers the axle. This is reached by the supplied drop pitman arm. The kit maintains the Super Duty’s O.E. caster angles with its radius arm drop bracket. This kit also levels the front and rear of the vehicle, gives you 4.5” extra ground clearance, and the anti-axle wrap rear blocks eliminate standard lift block problem while maintaining the quality of a stock ride. This package does not work with V-8 gas engine models, dually models and V10 gas engine models need an exhaust modification so you can clear the front driveshaft. You must take off any overload leafs. 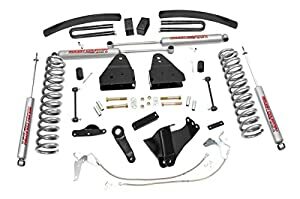 The kit comes with Front lifted coil springs, radius arm drop brackets, extended sway-bar links, track bar drop bracket, Pitman arm, Stainless steel braided brake lines and bump stop spacers. The rear includes anti-wrap lift blocks, carrier bearing drop bracket and U-bolts. 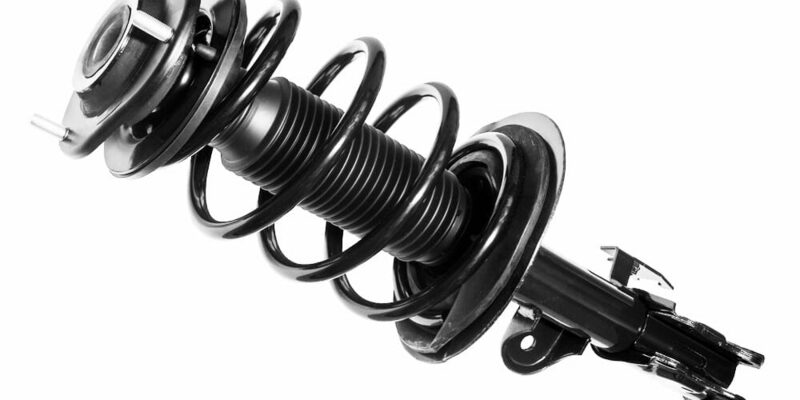 There are 4 Premium N2.0 shock absorbers and the hardware necessary or a fast and easy installation. The ICON Vehicle Dynamics 4.5” Ford Super Duty Suspension Systems is good for all 2005-2007 Ford F-250 / F-350 SuperDuty trucks. 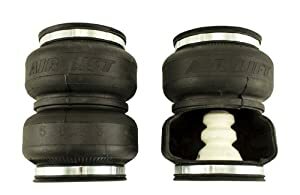 It comes with 4.5” to 5” ride height adjustable coil-overs, improved quality of wheel travel and rides over stock. Installation is easy, using their bolt-in system which fits in the OE coil bucket location. This kit gives you coil-over conversions compensating for secondary shocks, and the 7/8” coil over body comes with a Corrosion resistant cadmium plate. This kit provides you with lifetime guaranteed Eibach coil springs and FK Rod End Bearings. The kit gives you OEM wheel and tire fitment, with 8.5-9″ Wide, 5″ Backspace aftermarket wheels sizes, and 35 x 12.50 aftermarket tires. The Rough Country # 594.20 6” Suspension Lift Kit is good for all 2008 – 2010 4WD Ford F-250/350 Super Duty trucks. This kit comes with the Rough Country N2.0 shock absorbers, so you get that premium smooth ride. 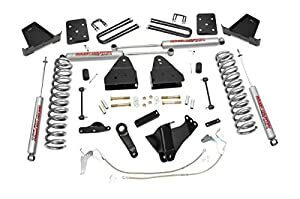 This kit comes with coil springs matching OE coils and a relocation bracket heavy-duty track bar that matches the steering angles and centers the axle. This is reached by the supplied drop pitman arm. The kit maintains the Super Duty’s O.E. caster angles with its radius arm drop bracket. 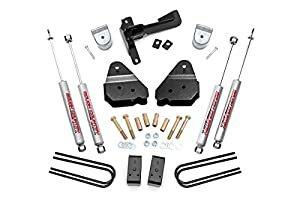 This kit also levels the front and rear of the vehicle, gives you 6” extra ground clearance, and the anti-axle wrap rear blocks eliminate standard lift block problem while maintaining the quality of a stock ride. This package does not work with dual models, and you must take off any overload leaves. This suspension features luxury ride coil springs matching OE coils rates and the heavy-duty track bar relocation bracket properly centers the axle this matches the steering angles made by the drop pitman arm. The radius arm drops brackets keep the Super Duty’s O.E. caster angles in place. Keep an eye on your u-bolts. The longer bolts will stretch and loosen, be prepared to re-torque them for your safety. Never stack lift bolts, they collapse quickly when the U-bolt loosens.